We nominated Missouri Department of Mental Health (DMH) to receive the Community Partnership Award for their collaborative work with our OACAC Housing Program. Through this partnership with DMH, OACAC currently serves 51 households with the Shelter Plus Care and DMH Rental Assistance Programs, creating long-term housing stability. 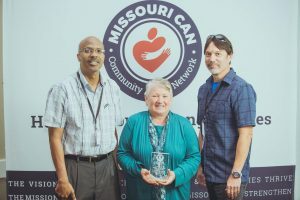 Liz Hagar-Mace, DMH Housing Director, is pictured receiving this award from Missouri Community Action Network (CAN) and OACAC staff during the Missouri CAN 2018 Annual Conference.